Firstly I would like to see moons as something rare. Maybe like 10% colonisable planets would have them? Maybe even less? Definietly NOT something to be expected to have on each planet. Also chances of having more than one moon should be even lesser, or not an option at all (exept for gas gigants, which should have fairy big chances of having moons in larger amonts - but I will get to those later). Secondly I think that each homeworld of factions should either have exacly one moon - always... Or have no moons at all - always. One way, or another. No that some factions will get lucky, while others will not... Unless we want high random element in this game (which is NOT a bad thing - just may be thing which might be undesired by Dev). Each planet can have some amount of buildings - this is capped by amounts of slots that planet do have, right? What moons could be doing - they could be a single slot by themselfs. So after all slots on planet are used for certian buildings, moon would provide one more slot. But it would be usable only after planet will reach certian level of development (planet could automatically send than some small colonisation/construction ship on it's moon that would claim it for use - and if that ship would get destroyed by enemy than after some amount of time next would be sent, etc.). As we do know asteroids will be used up due to mining. Than they may respawn as smaller and lesser ones, or not if one unchecked apropriate option. In latter case it is possible to simply run out of resourcec in very long game. Also it is possible for certian regions of space to run dry, when other still have sourcec of resources intact. This can led to awesome and interesting scenarios. But having moons (that are rare occurance) as unlimited sources of resources is also awesome and interesting scenarios, as it will tigger fights for control over those spots. Also, it must be noted that while Moons would remain infinite source of resources - it should also be very inefficient in that regard - every other finite source should be way more efficient when it comes to speed of extraction. I think that best example here are Gems in Dungeon Keeper - it was always better to mine gold, as mining gems was simply very long procces. Only upper hand that gems had over gold is being infinite source. Mining moons should be even less efficient than clearing wreckages after battle. This idea is simmilar to first point in that regard, that moons would be "just" another spot for one building, and that planet should have certian level of development in order to "unlock" moon. However insted of being able to build some regular facilities, moons would be insted places that You can build some more special/unique buildings. DO NOT GET ME WRONG - I DO NOT WANT CIVs' WONDERS MECHANIC! I am suggesting that there would be several buildings that Your empire would get benefits from, that would be buildable only at moons - not on planets. Lore wise those buildings would get benefit of low gravity, no need of worrying about planetary ecosystem, no atmosphere etc. and that is why they would be more efficient than planetary ones. - impenetratable planetary shields that protect whole planet from any direct damage, so enemy fleet would have to destroy base on moon before they could harm planet (just like with Death Star from Star Wars at the end). Yea - examples boring as hell - but gameplay wise gaining acces to more efficient buildings, that require certian conditions to be met, and can be placed in only certian aearas is interesting game mechanic. What is important to keep in mind is to not make them too powerfull, and not make them too important - they all should be repleacable by bunch of planetary structures of same functionality. To the point - those should be considered as nice bonus, not winning card. I would like to point out that only 1 and 3 points are kind of mutually exclusive. Not technicly - moons could function in both those ways. But logically there is exacly NO reasons to make it possible to build lesser and bigger structures. I mean - why would I want to place on moon normal, planetary shipyard when in same time I could build one with bonus to construction speed? That is why I think that points 1 and 3 are logically mutually exclusive. Moons may be used as mining spots, that never run dry OR as additional place for some facilities... But as long as it is used as place for facility it can not be mined. So at begining, when moons are not accesible for buildings, player could use them for mining - exept he has plenty of asteroids that are better source of resources. But later in game, he gets acces (due to planet getting more developed) to moons, and He has less and less asteroids to extract resources from. That puts player in front of chooice - to use moon as mining spot? Or is it better to use it for building some helpfull facilities? Gas Gigants, unlike terran planets should have increased propability of having moons. Moreover they should have sometimes two or even three moons, unlike terran planets. However their moons can not be used as building spots, as Gas Gigants are uncolonisable... To their only role would be to become unlimited mines. Simple? Simple! Alternatively all moons could be classified as barren. Moons would not add up to colony population - if "colonised" for providing place under facility construction it would be assumed that there is only necessary crew to build and operate said facility and propably their families - but that is all. No additional "guests". Only necessary personel. All right. I said what I wanted to say. Now I do hope that my ideas will be liked and supported by others. Thank You for reading! 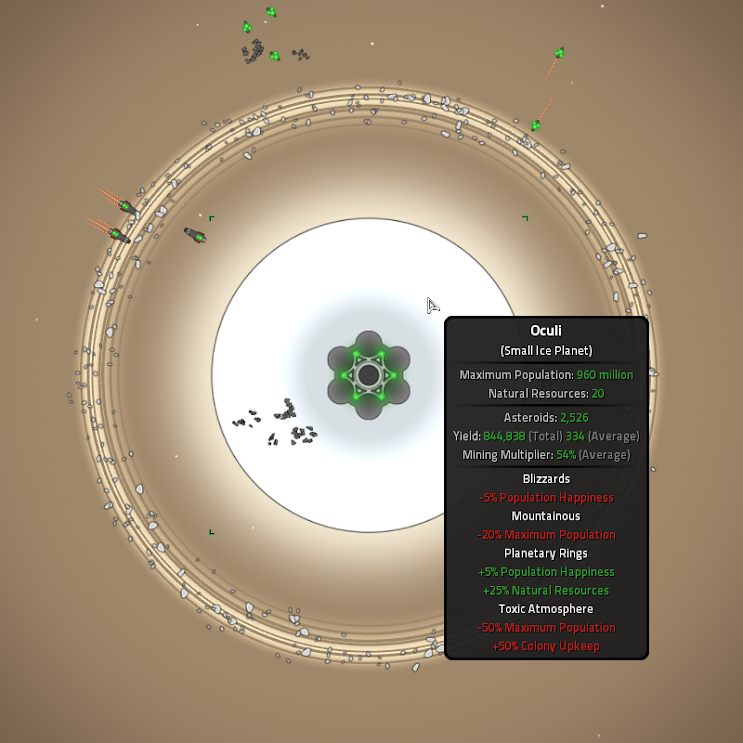 In an early version of Galaxial, you can see that there are many planets around a star. I asked a long time ago to Stuart, why he decided to remove them and he responded me that the game became too dispersive. In fact all ships will require a warp engine, to move from a planet to another one. In addition to planets, jumpgates will require another slot around the system or they have to orbit around a planet. A moon would be different, but if it orbits around a planet it would be too exposed to an attack from enemy (I think moon will be very near to planet "sector's" boundaries. In general I quote Modest, but I will prefer to see a almost-complete version of the game before. Maybe a gameplay! Thrank wrote: A moon would be different, but if it orbits around a planet it would be too exposed to an attack from enemy (I think moon will be very near to planet "sector's" boundaries. Haha And I imagined it to be in halfway betwen boundaries and center... A bit after (from center point of view) asteroid belts... Or even inside those belts But seriously that is more a matter of game ballancing and checking what works best, not our imagination. Moons are definitely something I would like to add in the future and it is certainly feasible. I would like them to be used as a way of providing bonuses to the planet they orbit and for extra building slots as you mentioned. I think having many climate types would be better, as then you could assign more varied bonuses to each of them. You wont be able to colonize moons or invade them manually as that would cause all sorts of design problems. I think they would have to switch control automatically to whoever owns the planet. Not sure about using them for resources. It would have to be an entirely new resource type to the game, not to replace asteroid mining for metals. Moons would have to wait for an update after release however, my workload to get the game released is already really high! StuartMorgan wrote: I think having many climate types would be better, as then you could assign more varied bonuses to each of them. Indeed it would be much better. Reason I suggested only one climate type is that I just assumed it would be lots of work with many climates types. Adding new planet (or moon) type is really easy in Galaxial. Just a ~30 line XML file for each one.